Singer Mary Stallings enchants audiences around the world with her divine musicality, elegant stage presence, and a voice that is, according to the San Francisco Chronicle, "supple and timeless, encompassing the whole history of music." Her more than 40 years of experience — from her start with the bands of Count Basie and Dizzy Gillespie to the undiluted passion of her solo recordings — shine through with every note. The New York Times says she's "perhaps the best jazz singer alive today" and her latest HighNote recording offers ample proof. With the supremely gifted pianist, composer, arranger Eric Reed as Music Director, Mary offers ten tunes which show the full range of her considerable talents. 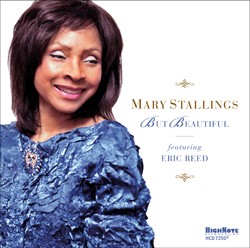 From bluesy swing to hushed seductive tones, Mary Stallings has it all.